CPS Energy‘s inaugural Future of Energy Symposium half-day event launched a series of engaging dialogues between our community, the energy industry and our local, community-owned gas and electric utility. 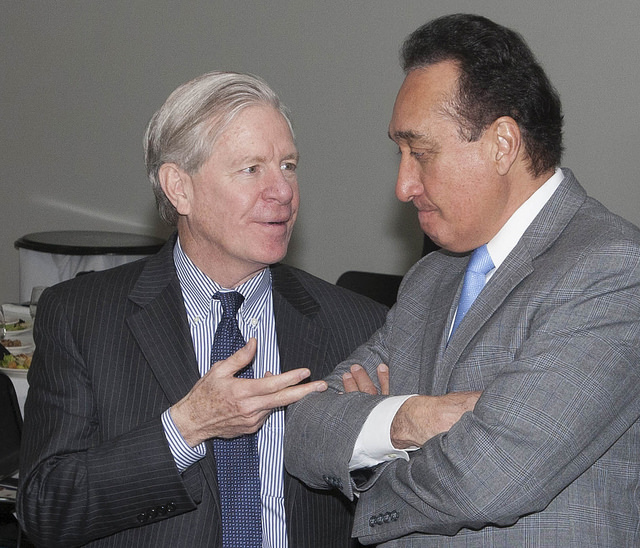 CPS Energy Board member John Steen chats with former Mayor and HUD Secretary Henry Cisneros. “We’ve been standing on the shoulders of greatness for 157 years” said CPS Energy CEO Paula Gold-Williams, alluding to CPS Energy’s beginnings as a local privately run gas company in 1860. The City of San Antonio purchased the utility in 1942 and CPS Energy celebrates its 75th year of community ownership in 2017. “The value proposition is moving away from power generation and closer to the customer,” said Gold-Williams striking on a change-is-the-only constant theme that coursed throughout the day. How the utility plans to navigate the rapid pivots and turns resulting from technology, politics and the market characterized all six sessions Monday afternoon. “We have 11 billion in assets, mostly in generation. We need to figure out how to reform that,” said Gold-Williams. Representatives from private sector New Energy Economy partner companies, national thought leaders and energy consultants joined the discussions with CPS Energy leadership and the crowd of 150 people. Michael Bell, President and CEO of Silver Spring Networks, the California company that opened offices here in 2014 and is largely responsible for bringing smart meters to San Antonio, sang technology’s praises. “Utilities have been doing the Internet of things for years,” he said. If technology can allow utility staff to “talk to your meter” from afar, “300,000 truck rolls are prevented” resulting in massive savings for the community, said Bell. He also predicted a “trusted advisor role” for utilities. For example, with customers’ permission, the utility could someday serve as a “trusted data broker” whereby energy use data would be sold to an outside company for research and/or product development. The customer would be financially compensated for the data, turning the current business model on its head. Distributed generation–that is, the generation of electrical power on site, most often via solar panels in this part of the world–also dominated the discussion. As more customers create their own electricity, sometimes even selling a surplus back to the grid, demand is declining, said Jan Vrins, Managing Director of Navigant, a global energy consulting firm. “Efficiency is also driving a decrease in usage as air conditioners and other appliances are operating 60 percent more efficiently than in the paste,” he said. Vrins congratulated CPS Energy on its 2-3% growth at a time when most utilities are fighting for market share in a shrinking, competitive market. Energy expert Becky Klein of Klein Energy, LLC lauded CPS Energy’s reputation for innovation outside the state. She also predicted that nuclear power will make a comeback, but will return reformed as smaller, 50 MW reactors that can be grouped into “12-packs.” Political consultant Rob Talley of Talley & Associates noted the lack of a comprehensive energy policy as the reason nuclear power is often shunned. Despite a sea of change and many challenges ahead, the day ended with optimism. Mayor Ivy Taylor closed out the sessions noting that CPS Energy has returned $7 billion in funds to the community.